hey y'all! its been awhile since i had a proper outfit post. so i decided to get a little creative / and also i've ran out of things to wear < i know right? i kinda feel that the kimono trend is slowly coming up again so here's my causal get up. i wrapped and safety pinned up my peacock printed cardigan from topshop into a kimono top, paired it with denim skirt (i promise i'll iron my clothes more often), vintage bucket bag and sparkle loafers from styledasher. new iPhone covers for my iPhone 5! woohoo! 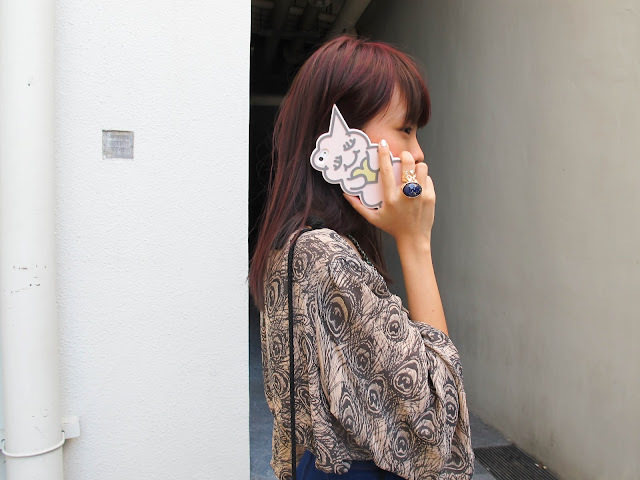 the very nice people from candies gifts (http://www.candies-gifts.com) sent over some super adorable iPhone covers! thank you for pimping my phone! so back to my day, marc and i had lunch at the highly raved maki san, located at cathay basement one for the very first time! well i gotta admit it was indeed a pretty interesting place to dine at, from the very well done illustrations to choosing our own ingredients and sauces for the sushi. i had like - steamed ebi / tuna mayo / crab stick / asparagus / fish roe / unagi / fish flakes / teriyaki - and i honestly don't know how my combination can still taste so good........do give them a try if you have not! it costs less than $10. hope you had a great weekend!